Vitamin C + Sunscreen by Day, Vitamin A by Night! Well formulated, stablised vitamin C provides all-important antioxidant protection as well as stimulating collagen production and blocking the development of pigment for smoother and brighter skin. Apply vitamin C in the morning for an all-day urban shield against everyday environmental factors which can cause skin ageing. It is estimated that 80% of skin ageing is caused by the sun. Sadly, skin damage caused by the sun doesn’t only happen when it’s sunny. If it is light out, it means the sun’s rays can still reach you. Even on a cloudy day, you will still get approximately 50% of UV reaching your skin. Wearing high-strength sun protection every day is fundamental for a youthful complexion. 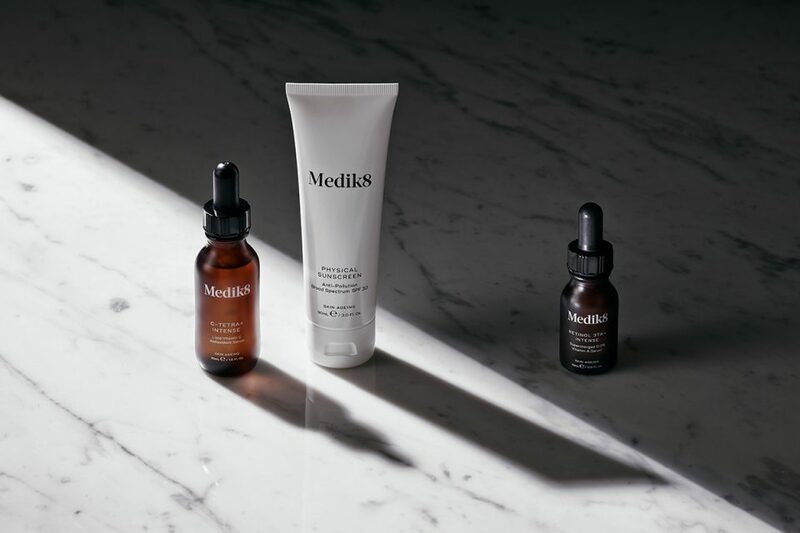 With its importance in mind, Medik8 have a range of beautifully light but powerful sunscreens that protect and nourish the skin. Don’t worry, the high-tech Medik8 sunscreens do not feel sticky and greasy like those used at the beach. More likely, you’ll probably not even realise your sumptuous day cream contains sunscreen. As the Experts in vitamin A (aka retinol), Medik8 has developed a wide range of night creams and serums to rejuvenate skin while you sleep. Vitamin A is quite simply the most important ingredient in anti-ageing skincare. It has a wealth of skin benefits including speeding up cellular renewal and reducing sebum production. It is crucial that Vitamin A is stabilised and has some form of controlled-release to ensure maximum potency with minimal irritation. Anti-ageing skincare doesn’t need to be complicated – in fact, it shouldn’t be. Following Medik8’s simple CSA philosophy will help improve the tone and texture of your skin; leaving it healthy and youthful-looking! We are proud to stock their products here at Dermaworks – please click the link below for our competitive prices. However if you are unsure as to which product would be best suited for you, please do not hesitate to ask, we would be delighted to help!